My name is Kelly van Eijndhoven and I live in Son en Breugel, in the south of Netherlands. Everything started in 1994 when we got our Bernese Mountain Dog, called Tessa. With Tessa I started to train obedience. In 1997 the second dog, a Jack Russel Terrier called Gizmo, came into our lives. With her I continued with the obedience training but also started with agility. In 2000 it was time for the third dog, another Jack Russel Terrier called Thyra. With Thyra I also train obedience and agility. 2004 its was time to say goodbye to Tessa, she have had a happy life for about 10 years. And after her dead and Gizmo and Thyra getting older I started to look around for a larger dog that I also could have to obedience and agility. I decided to search for a friendly, intelligent and active breed, and then I found the Nova Scotia Duck Tolling Retriever. In 2005 my first Toller (Nova Scotia Duck Tolling Retriever), called Eshra, came into my life. In her I found everything that I was looking for! She is great but sadly she got the eyedisease PRA. In 2007 my second Toller, called Mayla, came to me. She is also great and have a very nice personality. With Eshra and Mayla I train agility and also started with retrieving and rally-obedience. Ofcourse I also visit dogshows with my girls. 2003 I got my KK1 certificate but it wasn't before 2006 I started my plans to breed. That year I registrated my kennelname; Alba Nuadh, that means Nova Scotia in Gaelic. When I'm planning a litter health, character and how the dogs look is very important for me. The first Alba Nuadh litter was born in 2009 and the only girl, called Stevie, stayed with us. 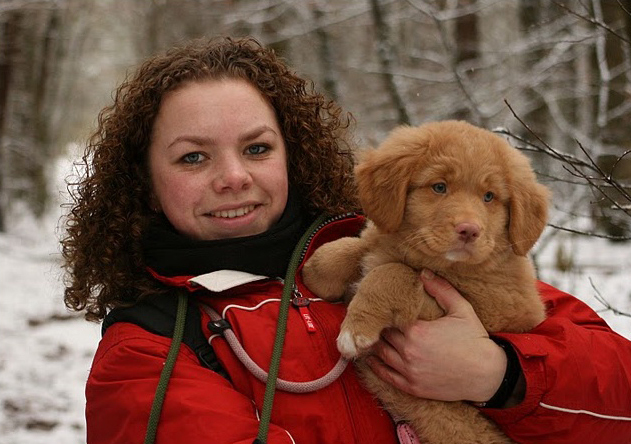 I'm a member of the Vereniging voor de Nova Scotia Duck Tolling Retriever, Nova Scotia Duck Tolling Retriever Club Nederland, and the Belgium Tollerclub. Me and Aiden from the A-litter.